Join the Clone Wars with these thrilling figures, each packaged with a fun game piece! 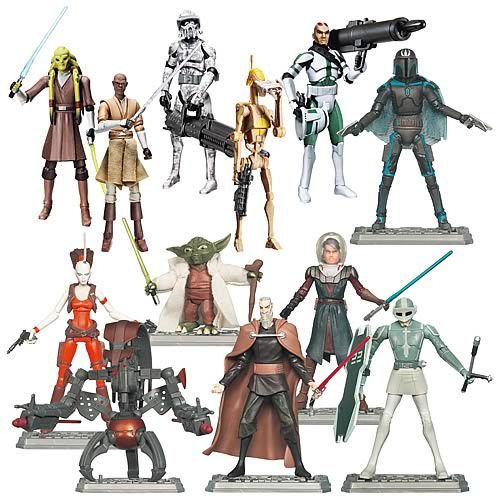 Case of 12 exciting 3 3/4-inch Star Wars action figures in an animated style. Articulated wrists, removable helmets, and more! Loaded with awesome action features! Star Wars returns to television, and this exciting collection brings back some old favorites, as well as a number of new faces… in a whole new way. These 3 3/4-inch scale plastic action figures include terrific accessories and fun details. You'll find such distinguishing touches as articulated wrists, removable helmets, and much more. Jump into the Clone Wars by adding these to your order now! Add to your Star Wars: The Clone Wars viewing fun with these fantastic figures from the show!